People who struggle with acne on the face may also experience this skin issue on the back and chest. Some people believe that acne is caused by dirty skin, consuming greasy foods or consuming chocolate. However, these are myths. Acne is caused when pores become clogged. Genetics and hormones appear to play a role in developing acne. Fortunately, there are several treatment options that can get face, back and chest acne under control. Try over-the-counter treatments. Look for washes that contain the active ingredient benzoyl peroxide, salicylic acid or sulfur, which are popular for fighting face, back and chest acne. Over-the-counter treatments are common for mild acne. Moderate to severe acne will require stronger treatment options. Visit a dermatologist to discuss prescription topical medications. A dermatologist may prescribe a strong salicylic acid treatment for back and chest acne. For the face, she may prescription lotions, such as tazarotene, adapalene and tretinoin. These medications work by encouraging cell turnover, which prevents the hair follicle from becoming clogged. Ask your dermatologist about antibiotic treatments. Moderate to severe acne that doesn't respond to topical treatment may require antibiotics, according to MayoClinic.com. Oral antibiotics fight acne on the face, back and chest by reducing bacteria and fighting skin inflammation. When your symptoms improve, the doctor may recommend tapering off and using a topical treatment to avoid antibiotic residence. Consider using isotretinoin for deep cysts. Isotretinoin, also known as Accutane, is a powerful oral medication used to treat face, back and chest acne. This medication is recommended if antibiotics and topical treatments aren't working. However, this is a powerful medication that causes serious birth defects in pregnant women. Women who are pregnant or may become pregnant shouldn't take Accutane. Use birth control for hormonal acne in women. Oral contraceptives with ethinyl estradiol and norgestimate may improve acne in the face, back and chest for women. 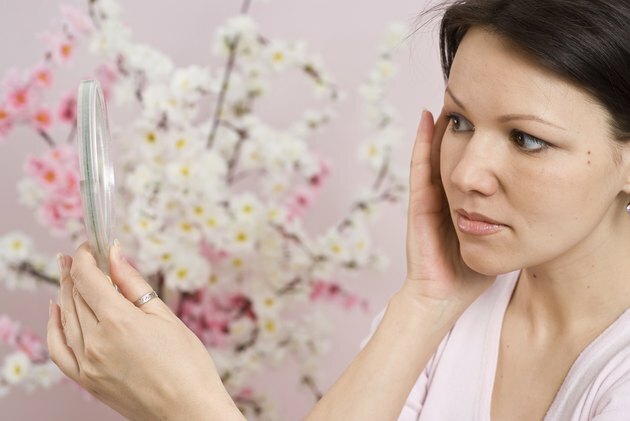 If acne breakouts occur most frequently during the menstrual cycle, this may be an option. People with acne may also experience scaring. Talk with your doctor about treatments for scars such as laser treatments or microdermabrasion. For more serious scars, minor surgery procedures can help. Talk with your doctor about treatment side effects before making a final decision on treatment for back, chest and face acne. Some treatments have more serious side effects than others.